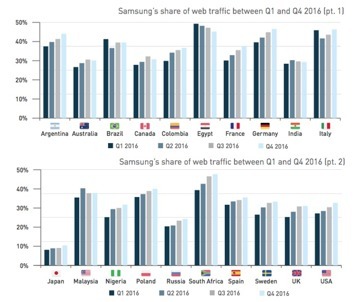 The research from analytics firm DeviceAtlas, based on web usage data derived from User Agent strings, found web traffic from Samsung devices "grew significantly" in the fourth quarter of 2016, increasing in a number of major markets by over 2 percent, including the United States at 2.3 percent, and Italy with a 2.7 percent rise. In the quarter, Samsung declared it had the best fourth quarter performance for the last three years, with sales of other smartphones helping counteract the bad publicity caused by the Note 7 recall fiasco. A Gartner report earlier this month was more pessimistic on the effects of the recall, with shipment estimates for the quarter down 2.9 percent year-on-year. For the same quarter, the share of web traffic attributed to Apple devices dropped in many markets, including 5 percent in Italy and 3.6 percent in the U.S. 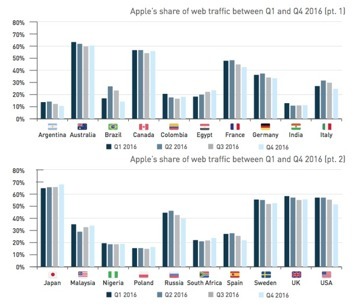 Despite the reductions of usage in most markets, Apple's web traffic share did increase in a few, with Japan up 2.2 percent, South Africa up 2 percent, and up 1.7 percent in Canada. 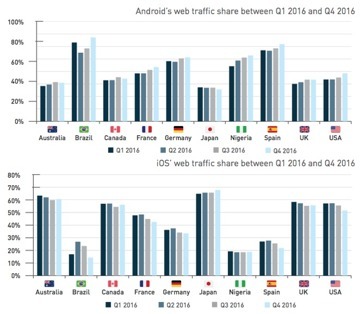 When comparing Android against iOS, Android continues to have a higher market share overall. 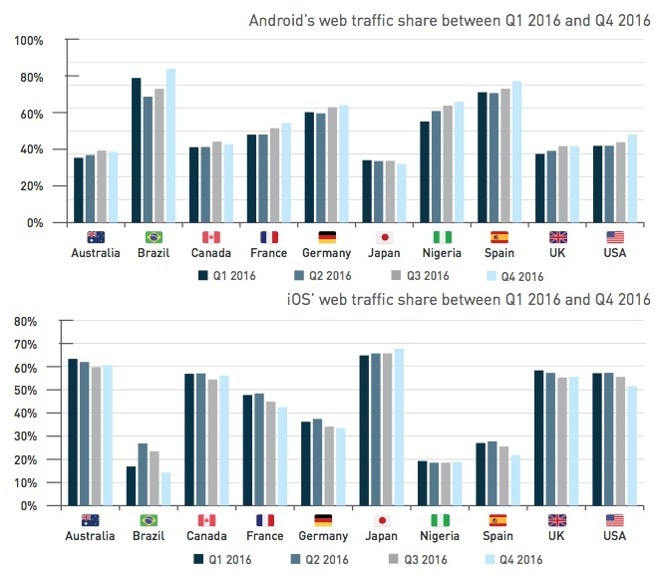 The data reveals there are 42 countries out of 56 where Android devices generate more web traffic, while iOS traffic is higher in 14 countries. It is noted that countries with a preference for using iPhones to go online over Android are highly-developed regions, with Japan and Denmark heading up the list, followed by countries including the UK. Canada, Australia, and the United States. On the other end of the scale, Android is seen to be extremely popular in markets with a generally weaker economy, where Android smartphones are bought due to their lower cost. Older models of the iPhone are still being used in a number of areas, with the report noting their long lifespan and high resale value making them "a better investment than most Android phones." 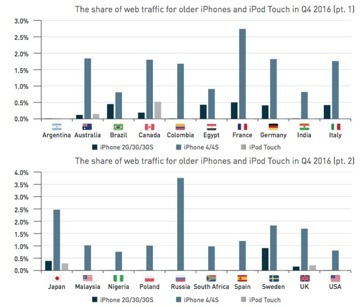 The iPhone 4 and iPhone 4s still has over 3.5 percent of the mobile web traffic share in Russia, with over 2 percent in France and Japan. The original iPhone, as well as the 3G and 3GS, are still in use in some countries, making up close to 1 percent of mobile web traffic in Sweden, and has a share of around 0.5 percent in France, Japan, Brazil, Germany, and Italy. The iPod Touch is still holding a 0.5 percent share in Canada, with lower percentages detected in Australia, the United Kingdom, and Japan. DeviceAtlas also examined the popularity of iPhones with a 4-inch screen for web browsing compared to the other sizes of iPhone, in a small number of markets in the last quarter. In some areas, it is noted that web traffic from 4-inch iPhones is close to the popularity of 4.7-inch iPhones, and is the most popular in Russia. 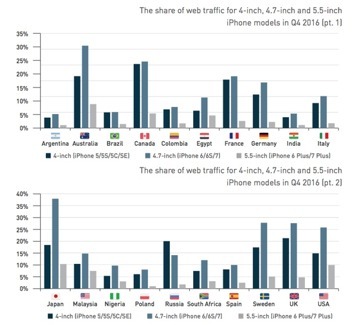 It is noted that web traffic for 5.5-inch Plus models of iPhones is significantly lower than the other two display sizes in many cases. 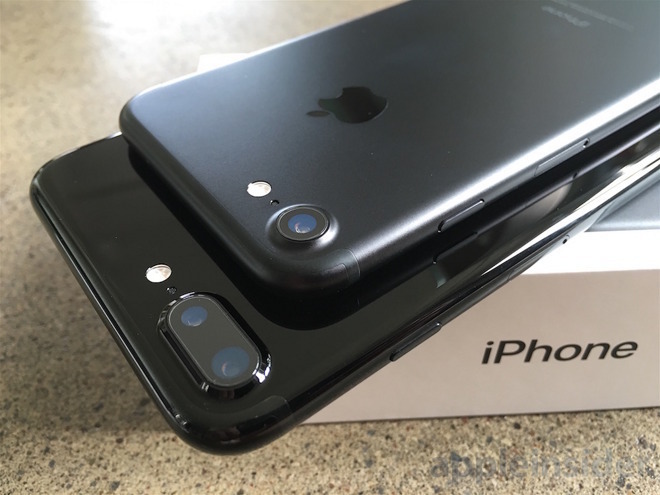 DeviceAtlas suggests that pricing may be more of an important factor than user preferences in this case, due to the high price of plus models compared to the 4-inch versions.